multipurpose educational organizations in the Caspian Sea region nowadays. The present mission of the ASU is to become an international university complex in the south-east of Russia, forming new scientific, educational and innovative clusters in the regional economy. The functions of the University is both training experts and fundamental researchers and export of educational services as well as transfer of new technologies to industry and business. Institute of Language and Professional Communication. There are 21 schools, 1 college, 83 departments, an affiliated branch in the city of Znamensk. The University complex consists of 10 educational buildings, 37 computer centers, provided with high speed Internet access and 6 comfortable students' hostels. The University offers education in more than 100 popular specialties and courses, including 12 programs of professional retraining and 23 programs of advanced training, 16 specialties of professional and technical training. The graduates of ASU work in governmental, scientific and educational institutions, in the sphere of industry, agriculture and mass media. Nowadays 17 000 students, 600 postgraduate students and PhD-students are studying at the University. ASU is a member of the Association of the Universities of the Caspian Region. It actively develops international cooperation. In cooperation with partner-universities from Finland, Italy, Croatia, Hungary, Germany, France, China, Iran, Egypt, the USA, Uzbekistan ASU is implementing the following programs: short-term language courses, student exchange, joint scientific and innovative projects, joint student courses and international conferences. There is the Office of International relations at ASU, which includes Center of Tempus programs (At the present time 6 joint educational programs are being developed together with the partners from France, Belgium, Finland, Great Britain and Germany) and Casa Caspian Nova (Russian and French Center of joint educational programs and research). In 2007 ASU launched "double degree" Master programs with the University of Nice Sophia Antipolis (France, Nice) and Clark University (USA, Massachusetts). Students from Iran, Korea, Italy, France, Turkey, Syria, Morocco, Congo and other countries study at the University. Some programs of ASU were evaluated according to ECTS. ASU has become the first Russian university chosen by Harvard University (USA) for the realization of the educational program on international competitiveness. ASU aims to create the multilingual educational conditions. Every student or post- graduate student studies 1 or 2 foreign languages during the whole period of education in order to become a competitive specialist and use this knowledge of languages in his or her future professional activity. ASU is one of the 16 basic Russian institutes which form the University of Shanghai Cooperation Organisation. The UNESCO Chair "Learning Society and Social Sustainable Development" operates in the University. Its aim is to form regional system of lifelong education, to settle the issues related to the university joining the Bologna Process, to provide conditions for employment and increasing the level of prosperity of the population, decreasing of social tension, prevention of interethnic and inter- confessional collisions. ASU is one of the most rapidly developing innovative universities of Eastern Europe that comprises academic traditions and modern technologies. The speciality "Robots and Robotic Systems" was established on the basis of the Physical and Mathematical Institute of Innovative Development of ASU in 2008. Today this specialty comprises two groups RT-21 and RT-31 of the second and the third study years correspondingly. The chairs of "Electronics and Technical Physics" and "Information Systems" are the leaders in this speciality. The high-skilled lecturers of these chairs conduct the following courses: "Technology of Robot-Based Manufacturing", "Robots Engines/Drives", "Microprocessor Control of Robots and Their Software", "Robots and Robotic Systems Control", "Artificial Intelligence Methods" etc. The joint scientific and educational center "Regional Informatization, Control Systems and Mobile Technologies" of ASU and Saint-Petersburg Institute for Computer Science and Automatization of the Russian Academy of Science" (SPICSARAS) carries out its activity on the basis of the University where the students take practical training in the laboratories of control microprocessing equipment and information and measuring systems. The University also signed partnership contract with chair RK-10 "Robotic Systems" of Moscow State Technical University named after Bauman. 11 young lecturers of ASU are studying at Master School of that chair, what will enable to effect the training of the staff who will hold the special courses at ASU. Since 2007 French and Russian Centre for Applied Computer Science and Information Management Systems of the Future Casa Caspian Nova has been conducting its activity at ASU. The area of the centre activity is the implementation of joint Master degree programmes with one of the leading French universities - University of Nice Sofia Antipolis (Nice). In 2007 ASU signed the cooperation agreement with the University of Nice Sofia Antipolis. It was for the first time that Master degree programme "Multi-Media Devices, Data Bases and System Integration" (MBDS) was adopted for teaching in Russia within the framework of this agreement. 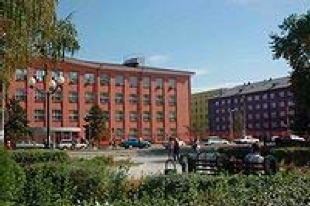 This one-year French Master degree programme in the sphere of modern information technologies appeared in 1990 under the auspices of industrial partners - IT-companies.Today the programme is focused on the development of multimedia applications with multilevel architecture and wireless technologies. MBDS deals with the development of prototypes of services ajoint multimedia devices, telecommunication, information transmitting units (chips NFC, RFID, sensing elements), robotic systems. 3. signalization system on the basis of autonomous mobile robot and conjugate temperature, moisture, illumination and sound detectors.